Nineteen-year-old Michael T. Sanchelli of St. Paul was stationed at CCC Camp No. 1721 near Isabella in northeastern Minnesota in 1934. One of his strongest memories from his CCC service was of fighting an unexpected forest fire—one that broke out in an area his crew had just left. Read the whole story. It started just like any other day, up at 5 A.M., breakfast at 6 A.M. and into the woods. I had quite an interesting job, I was measuring pulp logs for average diameter in a one-cord rack. I had a crew of four other boys with tapes; two would measure the diameter and the other two would measure the length of each log. The logs already had the bark removed. I would mark the circumference and the length down on a sheet of paper. All week the talk was of going to Ely, Minnesota on a week-end pass, and it had reached a big pitch. Everybody was waiting for quitting time. I had a new pair of navy blue trousers and a new light blue sweater that I was going to sport around at the dance that had been set up for us C.C.C. boys by the town's people. It was about 5 P.M. and still very hot. We were not going to eat supper in camp because we wanted a change of menu from the government Army-type food. I had only heard the fire bell once before, when the forester explained to us the laws and penalties of fighting forest fires. You could be recruited right off the road, and in those days a payment of 50 cents an hour was the compensation. A person who refused could be punished under the penalties of the law. When that fire bell rang, it looked like pandemonium had hit the camp. I almost went into a state of shock when the forester said, "You haven't got time to change clothes. Let's get going." When we arrived at the scene of the fire, a sickening feeling came over me. Less than two hours ago, my crew and I had left that very area. To make matters worse, I had to reprimand one of the crew for smoking, and I watched him as he buried the ashes of the pipe in the ground to make sure that a fire would not start from it. I'll never know whether he disobeyed after I left or not. The temperature was hot. The fire was hotter. The fire had reached the crowns of the evergreen trees, 75 to 100 feet in the tops above our heads, and the heat was almost unbearable. The pulp logs were burning fiercely, almost like evergreen nettles. We had to establish a fire line and all the burning logs, brush and trees had to be thrown and felled into the fire encirclement. We were very fortunate that there was no heavy wind that day and by midnight we had the fire under control. After that we strapped water tanks on our backs to squirt out the small fires. We had more than one camp fighting the fire, in fact we had enough men to station all around the fire perimeter. If I remember correctly it was about 160 acres of woods burnt; with a good wind it could have been 10 times as bad. It was 8 A.M. Saturday when the relief crew came out to relieve us. Thank goodness. I'd had enough. When I got back to camp I could hardly walk from the truck to the barracks. I felt numb all over. When I looked into the mirror, the face in the mirror looked like a face on a drinking spree: my eyes were bloodshot, my hair was all singed, my arms were red and the hair was gone from them. I then opened up my overcoat and I got a good look at my sporty pants and sweater. I couldn't believe my eyes. My pants had hundreds of holes in them, my sweater was just about burnt off, my shoes were no good. I was a total wreck. My thoughts later that day went back to that fire. Believe me it was still terrifying just to think of it. Nobody will ever know what it is to face an inferno until they actually get into it, with roaring flames above threatening to collapse on top of you and roaring flames on both sides wanting to engulf you - not to mention the searing heat. 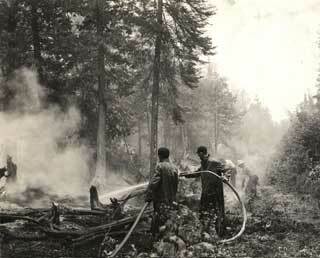 CCCs on the fireline, 1936. 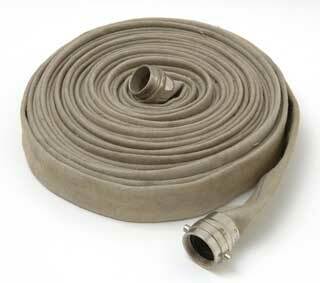 Unlined flax firehose, ca. 1932. Fire fighter's backpack, ca. 1930. 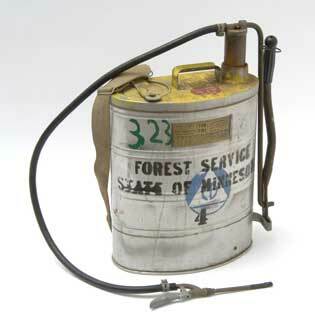 Sanchelli, Michael T., Forest Fire, Friday, April 13th, 1934, Isabella, Minn., Camp 1721, C.C.C.s. 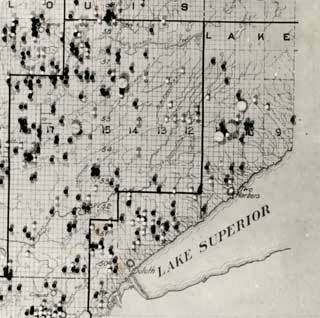 Minnesota Historical Society, Share Your Story, 2006.